How does language learning work? Below, you can read how I am investigating this. Please don’t hesitate to reach out if you are interested in knowing more about any of these projects or collaborating with me! If you are an undergraduate student excited about pursuing your own research into these questions, I would also love to hear from you! How do language production and comprehension differentially affect language learning? This is the main question that I am investigating during my PhD here at UW Madison with Maryellen MacDonald. We hypothesize that due to the nature of language production, learning about a given regularity will be different than in situations where people mostly comprehend but are not pushed to produce language. Keppenne, V., Hopman, E.W.M., & Jackson, C.N. (2019). Production training benefits comprehension of grammatical gender in L2 German. Talk to be presented at the 12th International Symposium of Bilingualism. Edmonton, AB, Canada. Keppenne, V., Hopman, E.W.M., & Jackson, C.N. (2019). Production training benefits both comprehension and production of grammatical gender agreement in L2 German. 32nd annual CUNY Conference on Human Sentence processing, Boulder, CO.
Hopman, E.W.M. & MacDonald, M.C. (2018). A little production practice provides a big boost in language learning. International Workshop on Language Production, Max Planck Institute for Psycholinguistics, Nijmegen, The Netherlands. Hopman, E.W.M. 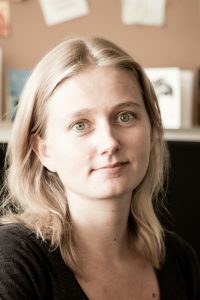 & Zettersten, M. (2018). Immediate feedback is critical for learning from your own productions. Psycholinguistics in Flanders, Ghent University, Belgium. Hopman, E.W.M. & MacDonald, M.C. (2018). Language production practice improves comprehension performance on grammatical dependencies in early L2 learning. 2nd International Symposium on Bilingual and L2 Processing in Adults and Children, TU Braunschweig. Best student talk award. Hopman, E.W.M. & MacDonald, M.C. (2017). Producing during Language Learning Affects Comprehension. 30th Annual CUNY Conference on Human Sentence processing, Cambridge, MA. What makes some words harder to learn than others in a second language? Although some factors have been identified robustly based on small scale experimental studies, many relevant factors are difficult to study in such experiments due to the amount of data necessary to test them. With Yiwen Wang, Bill Thompson, Joe Austerweil and Gary Lupyan, I am investigating this question in a large data set of users learning English as a second language through the Duolingo mobile app. In a regression analysis, we test several well-studied predictors of word learning accuracy like concreteness and cognate status. Furthermore, we investigate effects for both cross- linguistic semantic alignment and English semantic density, two novel predictors derived from large scale distributional models of lexical semantics. We also investigated several other psycholinguistically plausible word level predictors. Hopman, E.W.M., Thompson, B., Austerweil, J.L., & Lupyan, G. (2018). Predictors of L2 word learning accuracy: A big data investigation. Proceedings of the 40th annual meeting of the Cognitive Science Society, Madison, WI. Do people fully understand information from accented speech? Prior research on accented speech shows that listeners adapt to new accents fast, but also that there are differences in the way accented speech is processed. Teresa Turco won a Hilldale award to conduct a senior thesis to investigate comprehension of accented speech in classroom-style spoken explanations. We test native English speakers, in order to see if there is a difference in how they perform on questions about passages heard in Mandarin Chinese accented English versus American accented English. We also test native speakers of Mandarin Chinese who study here at UW-Madison. We ask if they do better on American accented English (the standard accent they hear in their classes) or on Mandarin Chinese accented English (which matches their own production of English). Turco, T.L., Hopman, E.W.M., & MacDonald, M.C. (2018). The effects of accented speech on knowledge Acquisition. Psycholinguistics in Flanders, Ghent University, Belgium. Does fluency in a second language make you more creative? In Joe Austerweil’s lab, I co-supervised Kendra Lange’s senior thesis which investigates individual differences in creativity as related to semantic networks and bilingualism. Some previous research has shown evidence that bilinguals are more creative. There are several different theoretical accounts about creativity in bilinguals, ranging from semantic network based mechanisms to skepticism about the existence of a bilingual advantage. We examine existence as well as hypothesized semantic network difference based mechanisms for the relationship between bilingualism and creativity here by measuring creativity and fluency for monolinguals and bilinguals. The fluency measure allows us to analyze the structure of individuals’ semantic networks (average shortest path length, clustering coefficient, and modularity). Lange, K., Hopman, E.W.M., Petit, E., Rao, A., Beckage, N., Zemla, J. & Austerweil, J.L. (2018). Possible mechanisms of bilingual advantage on creativity. 7th annual Midwest Cognitive Science Conference, Bloomington, IN. How do people learn multiple regularities? I’ve investigated this question in several research projects while obtaining my master’s degree. During my honors research project (conducted at Indiana University Bloomington with Caitlin Fausey) I investigated how people learn about a visual regularity in the presence of a linguistic regularity. I found that only when the linguistic input was uninformative did people learn about the visual regularity. During my master’s project (conducted at the Max Planck Institute for Psycholinguistics with Falk Huettig, Elisabeth Norcliffe and Caitlin Fausey) I investigated how people learn about a visual context regularity and a linguistic regularity at the same time, and I found that people are better at learning about linguistic regularities than visual regularities. Besides these projects of my own, I also worked for one year as a research assistant in the Magic Moments in Word Learning project (at the Donders Institute for Brain, Cognition and Behavior with Atsuko Takashima, Iske Bakker and James McQueen). The study I worked on investigated the neural correlates of novel word learning in children before and after puberty.